Richard was ordained priest on the Feast of St Francis, 2003. He trained for ministry at SEITE now St Augustine’s College. He also studied Theology at the University of Birmingham for his B.A. He did further studies at Heythrop College for an M.A. in Biblical Studies. His first encounter with the Holy Land was working as a volunteer for the Church of Scotland Hospice in Tiberias (now The Scots Hotel) in the 1980s. For three years he ran an Inter-Faith Project in East London. JulieAnn, his wife, is a Primary School Counsellor and for the time being is continuing in that role until she can secure a job in Jerusalem to enable her to join her husband. Their adult children, Nathaniel and Eliana, continue to pursue their careers and studies in the UK. 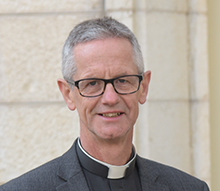 Dean Richard, in addition to his role as Dean of the College, is a Residentiary Canon of St George’s Cathedral, Jerusalem and is Honorary Canon of Southwark Cathedral in his home diocese in the Church of England. The Diocese of Southwark is Dean Richard’s sponsoring agency in his role as Dean.